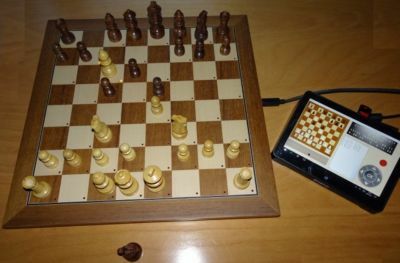 Guido Marquardt developed a chess computer on pc basis, which is a ripsnorter, a real sensation! 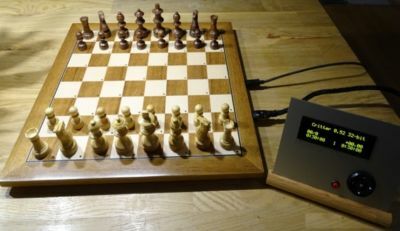 This chess computer is special within my collection; it's a noncommercial and d(o)i(t)y(ourself) chess computer. You could buy it, but shipping time is very long as I am a hobby enthusiast. My time is limited, because I always have other projects in process. In relation to ELO strength, Mysticum can compete against each and every chess computer in the world, because it can integrate almost all chess engines out there (e.g. Stockfish8 engine) and can be operated with fast microcontroller. But sheer ELO strength is not all; Mysticum can be throttled, for example to the speed of a 68020 cpu with 20 MHz, to keep up with the good old chess computers we all love. The picture shows my Mysticum II, which had been integrated into a clone of the Mephisto Exclusive board and below you can see my first Mysticum with a modified Mephisto Modular board. The prototype runs on a thin client board with Via C3 Nehemiah 1GHz cpu, Mysticum II runs on a Intel D945GSEJT board (20 mm high) with Atom N270 1,6GHz cpu. The speed can be throttled. The Mysticum operating system is working under MS Windows from XP to 10 with .net framework installed. Meanwhile it turned out that the best solution as pc hardware is a Windows tablet, for example a Dell Venue 8 Pro - it's cheap, slim and easy to use. With a special cable it's possible to run Mysticum and power up the Dell Venue tablet at the same time. That's not possible with other 7" to 8" tablets, because they only have one micro USB jack to power up and connect to external devices. Currently Guido is coding the mysticum software in the 3rd generation - beta versions are out already. In this version display and buttons are emulated on the touchscreen of the connected pc - they can disappear if needed. The pictures show such a Mysticum version, which can be upgraded with a operating module with display and buttons if needed. You can easily operate Mysticum via the display menu and its 6 buttons and at every time it can be extended with UCI and Winboard chess engines, which you can find in great quantities in the net - for free or to buy. You can run emulations of well known chess computers too, such as Mephisto III-S Glasgow, Mephisto Rebel 5, Mephisto MM IV, Mephisto MM V (5.0 und 5.1), Mephisto Amsterdam, Mephisto Dallas, Dallas16, Dallas32 and Mephisto Roma32. Partly the ROM content is without copyright - see the net for further details. With suitable engines like for example Shredder 12, Mysticum can adapt to your Elo strength. A serial connection via cable or Bluetooth to the Arena software running on a second pc is possible too. Look at the nice new manual from Michael P. to learn all it's functions: Mysticum Assembly Instruction/Manual. This guide reflects Carsten's pcb, which reduces the pcb assembly time remarkably. 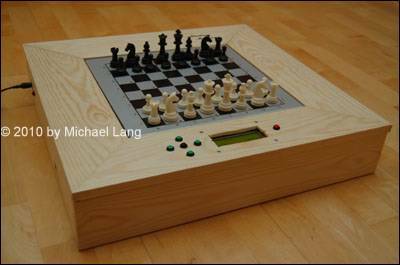 And all this for an affordable price - self-made in the basic configuration without housing - of roughly Euro 100,-- for the electronics plus Mephisto Modular top and chess pieces plus pc. In the workshop area you can watch a picture of this simple Mysticum - you only have to connect the pc via USB cable. 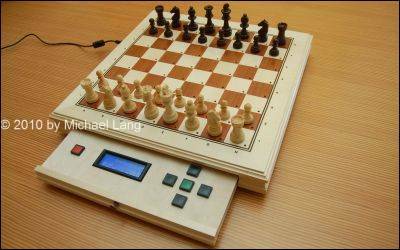 Who is interested in building this super chess computer on his own is invited to do so. Guido released all documentation and the software for private - non-commercial - use. Michael P. and me, we released all documentation and software for private - non-commercial - use too. Here you can find an up-to-date assembly instruction with manual included from Michael P., who designed a pc board too, which makes the assembly easy now. For your support I maintain a forum. Here you can find all technical documentation, which is necessary to build Mysticum. You can ask questions (in English) and you can read about ideas and proposals for the assembly (mostly in German). It would be nice if you present your Mysticum in the forum. Who isn't able to build a Mysticum completely on his own, because he has not enough experience in soldering or has less mechanical skills, can visit a workshop. The next workshop will take place in 2017, the exact timing allready fixed. We start on Friday evening at 6pm and finish on Sunday at 1pm. If there is additional need for another dead-line please contact me or post it in the forum. If you are not able at all to assemble your Mysticum on your own, but like to have one, contact me at webmaster(at)miclangschach(dot)de!